Yamaha has been manufacturing quality pianos for over one hundred years. Unparalleled in their beauty and musical range, Yamaha pianos are the ultimate expression of the piano maker’s art. Yamaha is proud to present a comprehensive line of incomparable pianos that reflect the company’s continually evolving acoustic and technological research and development. Choose from their full line of acoustic grand and upright pianos going from 44 inch console pianos to their widely acclaimed 9 foot CFX. Many of these pianos are also available as Disklavier pianos. Ever since it was introduced in 1986, these computer-age “player” pianos have evolved into instruments that can reproduce “live” acoustic piano concerts and emsemble music with instrumental backings and vocal tracks. The Disklavier is the ultimate piano for home entertainment systems, business establishments, or educations and creative environments. Don’t forget to try the new AvantGrand Piano. In creating the AvantGrand series of hybrid piano, Yamaha has transformed a long-held dream of piano lovers into reality through integration of the best that acoustic and digital technologies have to offer. This is an instrument that sounds, feels, and responds exactly like a grand piano, without imposing limitations on where and when you play. 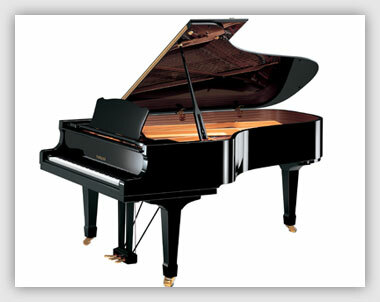 Now you can enjoy playing an exquisite grand piano, without the limitations that the size of such an instrument imposes.